Spirulina and chlorella are among the most popular freshwater microalgae because they are extremely rich in chlorophyll, which is the green pigment vital for photosynthesis that is found in all plants. Spirulina is blue-green algae because of the pigments in the cell wall which are chlorophyll and phycocyanin. Chlorella is a lighter green, round shaped algae that is about 2 to 10 micrometers in diameter. Spirulina and chlorella both have a very “green and fishy” taste and are added to juices or smoothies for an extra nutritional boost. Both algae are extremely high in complete protein which is more easily digested than animal protein. Spirulina and chlorella are rich in vitamins C, E and all B vitamins, including B12 which is rarely found in plants. Both algae contain high contents of macro minerals including, calcium, magnesium, zinc, and potassium. They also provide an excellent source of omega-3 fatty acids including GLA, mucopolysaccharides, beta-carotene and nucleic acids (RNA and DNA). So complete are they with nutrients that it is believed that people can live just on these algae alone for an extended length of time. Alkaline: Spirulina and chlorella have very good alkalinity and is beneficial in counter-acting acidic foods, therefore, balancing the body’s pH. Consuming more alkaline foods is linked to a healthier immune system. Anti-inflammatory: Due to their rich nutrients, these algae foods are helpful for relieving inflammation as in the case of arthritis. Chlorella is even helpful for reducing symptoms of fatty liver, hepatitis, peptic ulcers and bacterial infections. Arsenic poisoning: Researchers in Bangladesh conducted a three-month hospital study, where spirulina was given to 33 patients that were sick with arsenic poisoning and 17 patients received a placebo dose. 82 percent of the patients taking spirulina showed incredible improvements. Candida: Spirulina has proven to encourage and support the growth of healthy bacterial flora in the gut which can help keep Candida overgrowth under control. Individuals suffering from autoimmune diseases, chronic fatigue syndrome, lupus or fibromyalgia often have bacterial overgrowth and may benefit from consuming this algae. Cardiovascular health: The unique cell structure of mucopolysaccharides – easily digestible sugars and amino acids in spirulina is the reason for its ability to lower cholesterol and triglycerides, which helps prevent stroke and heart attack. 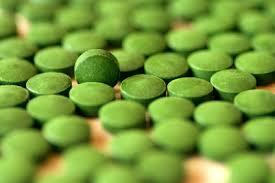 Detoxifying agent: Chlorella is a great way to detoxify the body of mercury poisoning and protects against radiation. It contains a high amount of chlorophyll which is helpful in the detoxification process. Spirulina, on the other hand, lacks a cell membrane so it is unable to remove heavy metals like chlorella can. However, it was successfully used in reducing sicknesses caused by radiation after the nuclear disaster at Chernobyl, Ukraine, in 1986. Enhance immunity: The powerful antioxidant content protects cells from damage. Studies have shown that spirulina stimulates the immune system to stop the development and spread of cancer cells. It has proven hopeful with inactivating the human immunodeficiency virus that is associated with HIV and AIDS. Gut health: Both algae encourage a healthy digestive system by being health food to the beneficial bacteria and at the same time, keeping the pathogens (harmful microbes) under control. A healthy gut is a healthy immune system. Health-building: The nutrients in these algae are useful for overall health-building: to balance blood sugar, brain chemistry, speed up healing and strengthen bones. They are pure and don’t need to be cooked. Seasonal allergies: According to a research study, five patients that were treated with spirulina noticed a relief of symptoms that were commonly linked with allergic rhinitis, such as nasal discharge and congestion, itching and sneezing. Vegetarians: Spirulina and chlorella have more complete protein than red meat or most plant sources of protein. Spirulina is about 65-71% complete protein, chlorella is 58% protein, whereas beef is only 22% and lentils are only 26% protein. Due to their rich vital amino acids and minerals you only need to consume about two tablespoons of the algae as a protein substitute for a meal. 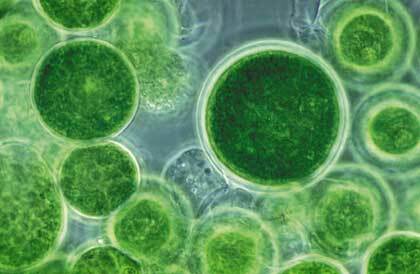 Since microalgae take on their environment, it is important to ensure you are getting the purest quality. Spirulina and chlorella come in the same dosage and are available in powder, tablet, or capsule form. However, they are best to be taken in powder form by including into your juices, smoothies and shakes. Consume 3,000 mg daily as a preventive supplement or 10,000 to 20,000 mg per day as therapeutic supplement. You can mix spirulina or chlorella powder into a smoothie or sprinkled on top of a salad for an excellent nutritional boost. 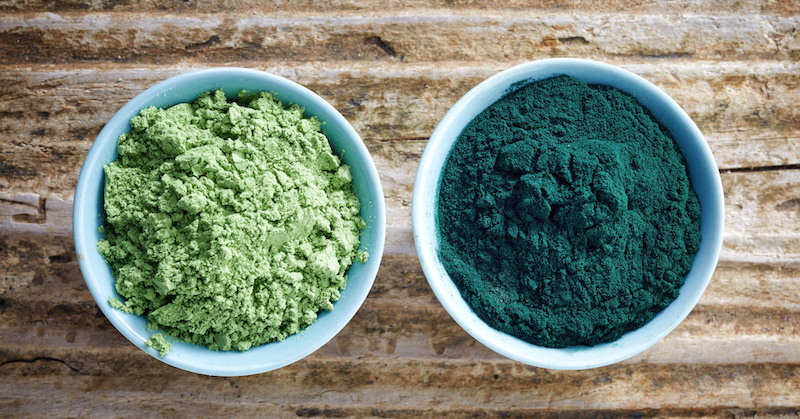 So, should you take spirulina or chlorella? I would usually suggest chlorella but some people may not be able to tolerate chlorella, in which case spirulina might be the next best choice. You will need to try it to know. Sprirulina and chlorella are powerful detoxifier so it is important to start with a small dose and work your way up so that you can see how your body responds, and then gradually increase your dosage. Some detoxification reactions that can possibly occur when consuming these algae are: a low-grade fever, dark green waste, excessive gas, restlessness, breaks out or itchy skin, and or sleepiness. These symptoms are temporary and are evidence that your body is responding to it. If you are pregnant, nursing or have hyperthyroidism you should discuss supplements with your health care provider.